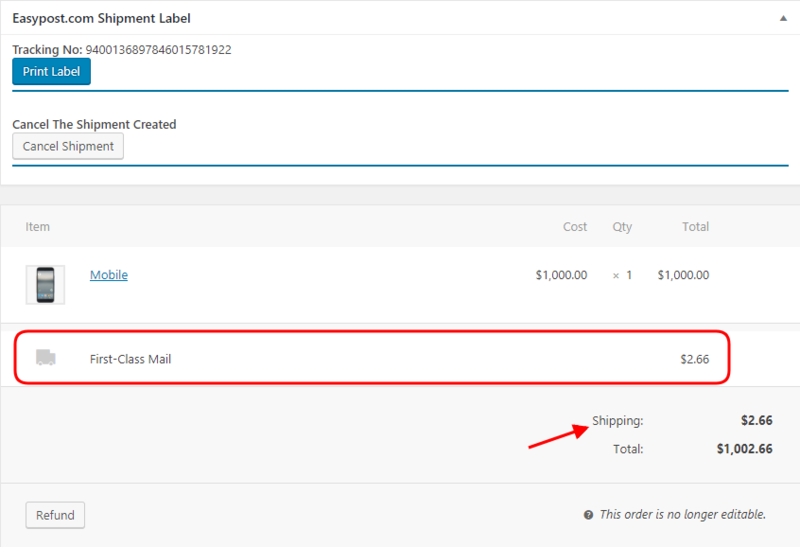 Home / Why Can’t We See Pricing of the Shipment in ELEX EasyPost Shipping Method Plugin for WooCommerce? hi, how come the plugin doesn’t show the price of the shipping label in the backend? I think this is an important feature…! We haven’t added that feature for the easy post plugin, we have that feature only in DHL plugin as of now, its still under observation, so once we confirm everything with that plugin is working fine we’ll incorporate in our other plugins as well. With the feeling that the feature needs to be in the overview page, we incorporated the feature. Now admin can see the shipping price along with the product cost in the order overview page. This section appears in a different section as shown below. When you click on select a different service other than the default service in the order overview page you can see the shipping rates changing in this section. You can’t change edit the shipment details once created. Still, you get to cancel the shipment you created before. Since the addition of this feature, users remain assured of the shipping cost and can check the different available services and their shipping charges too. ok because I got charged 3 times after clicking on the ‘generate label’ 3 times… since it doesn’t really give you a confirmation or ‘pop out’ box. I think you need to add this to the feature as well. another question is how do I make it to auto pack into certain size boxes? I filled out the box dimensions but it still generates each box separately based on my product weight. The generate label option might take some seconds to produce the label so once its completed you should get a confirmation that the order has been shipped with the tracking information. Regarding the box packing, you need to select the box packing based on weight and dimension and define the custom boxes, If the boxes dimensions are too small it will pack into multiple boxes if you have multiple items, to solve that you need to define a bigger box. What Happens After You Click on Create Label? The video here shows the small time lag between your click on ‘Create Shipment’ and the return of tracking info. As you can see that it takes a few seconds to Create Shipment and the new window opens with the tracking information for all the packages. A separate tracking Id is generated for each package created. In this case, we have three tracking Ids for the three packages created. So make sure you wait for few seconds to land on a new page with the tracking id of successfully created packages. If the shipment creation fails you get a failure message. This means if you are receiving a tracking Id, you can proceed to create labels. After you click on ‘Print Label’ the label opens in a new tab automatically. Once you find the label in the new tab, you can now save the label and print it. User’s next query was related to the box backing feature. To use the box packing facilities you need to select pack in box packing as shown. As per the user’s query, he was able to generate separate boxes per product. This was because he had ‘Pack items individually’ selected in the parcel packing options. With the box packing method, users can assign boxes to fit multiple products in one box. This helps in saving extra expenses on packing and shipping. another question, where do users see their tracking information? do we have to create a tracking page or something? Once the package I shipped the tracking information will be created, and when you mark the order as completed the tracking information will be sent to the customer along with the WooCommerce automated mail. The customer should be able to find the tracking information in My Accounts>Orders page as well. Where can Users Find Tacking Info? As the admin, you can the tracking information at three different positions. These appear on the top of order overview page after the creation of the package. It appears with the EasyPost shipment Label option. Each of the packages has its tracking id mentioned with it. The third is the EasyPost Shipment Tracking section. It lists all the tracking Ids. In the order actions section, you get options to manually send details to your customers. Did you ever ask why you should have EasyPost shipping method plugin for your WooCommerce store? EasyPost Shipping Method Plugin for WooCommerce is a built through our EasyPost Approved Integration Partnership! It integrates three most popular shipping services today with WooCommerce. You get a free business account of USPS, with the options of adding your existing FedEx and UPS account to your EasyPost account. All these three services provide live shipping rates and fulfillment services for your packages. You can print postage-paid shipment labels with each of the services. As you are aware of the fact that USPS e-VS require a minimum amount od shipment volume, but with EasyPost you can start with 1 shipment and print shipping labels with commercial plus shipping rates by USPS. Visit the documentation for a complete list of features of the plugin. Leave a comment or contact our Online Support for any of your pre-sales queries and technical help.